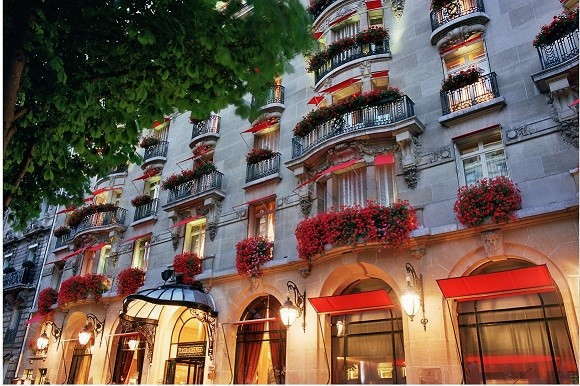 Distinguished by the scarlet flowers cascading over its elegant facade, this glamorous landmark hotel—a darling of the fashion set and Russian billionaires—sits on one of the most expensive avenues in Paris. The hotel was recently renovated, spiffing up existing rooms and adding two buildings and several beautiful luxury suites. The suites' interior design, led by Marie-José Pommereau, expertly places contemporary pieces in a luxe traditional setting, culminating in the two quintessentially Parisian Eiffel suites, where the looming tower is framed by floor-to-ceiling windows. Sumptuous rooms enchant with designer furnishings and luxurious conveniences like remote-control air-conditioning, compact sound systems, and even a pillow menu. YOU SHOULD KNOW Eiffel Tower views come at a price. Be sure to ask when booking if you can snag a lesser-priced room with a view. Luxurious marble baths, richly decorated in gold or silver mosaic tiles, sport generous walk-in showers, bathtubs, double sinks, voluminous towels, and heated toilet seats. 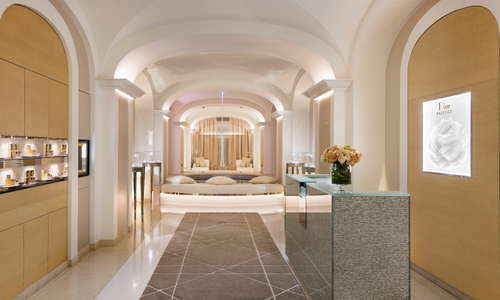 The splendid marble reception opens out onto La Galerie, an elegant corridor where you can enjoy a drink, snack or a lovely teatime (or just a cup of tea) with your morning paper. The beautiful, newly redesigned courtyard serves as the shady Cour Jardin restaurant in summer and a skating rink in winter. YOU SHOULD KNOW As elegant as it is, the Plaza Athénée seems to be a magnet for magnates of the kind that love the bling bling (notice the purple Jaguars parked out front). 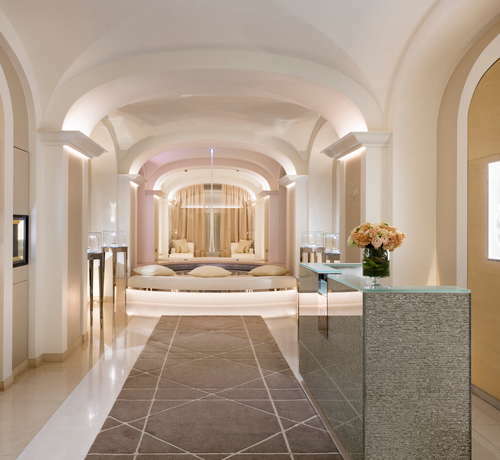 The Dior Institute—the sole exemplar in Europe—is beautiful, spacious and airy and offers a wide array of custom designed treatments, all of which begin with a private skin analysis and a short massage. Be sure to make good use of the steam room and sauna. Though small, the fitness area is crammed with the latest high-tech machinery. 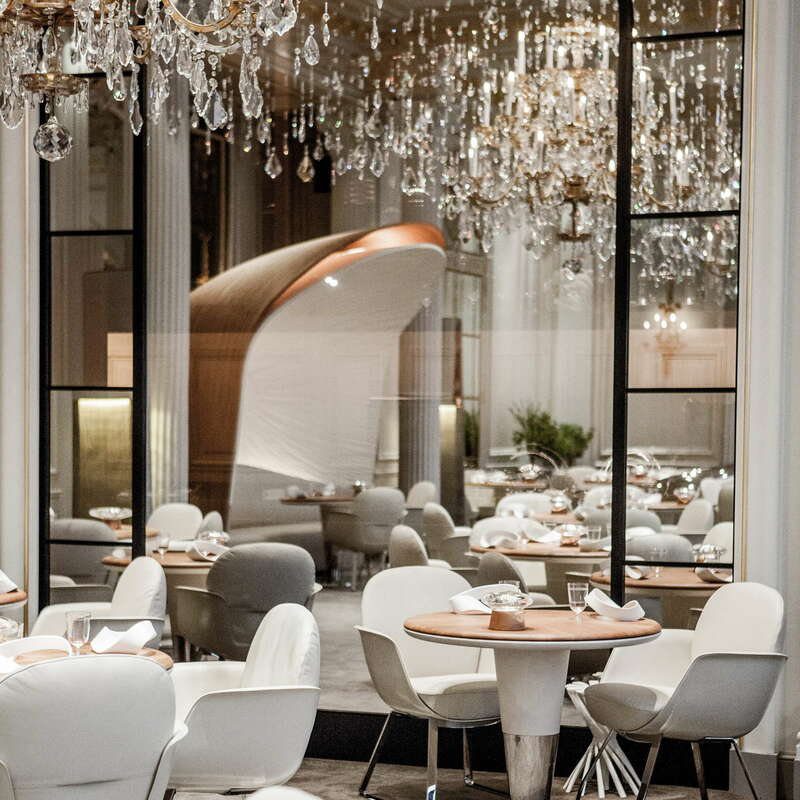 Assorted upscale dining options include superstar Alain Ducasse's first haute-vegetarian restaurant—a three-star contender for best restaurant in Paris—which was given a glittering new look that reflects the hotel's haute-couture grandeur. Carnivores never fear, the caviar is plentiful and the fish dishes divine. Or you can head to the wonderful Relais Plaza bistro, an Art Deco gem and listed historic monument, where hopping Wednesday jazz nights are a neighborhood institution. There is also dining in the sidewalk café, the lovely interior garden, and along Le Galerie corridor. 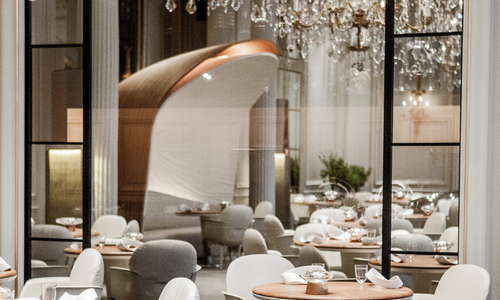 YOU SHOULD KNOW If you happened to be seated in Ducasse's one amphitheater-esque table, be careful what you say, the sound carries like, well... an amphitheater. Like the rest of the hotel, the imaginatively named Le Bar was given a facelift that included crinkly Yves Klein-blue ceiling sculptures and colored lights that seem incongruous with this elegantly wood-panelled space. In the quest to attract a younger, hipper crowd, the bar also features a live DJ and cocktails in sizes small, medium or large. The signature cocktail of champagne, cognac and fresh raspberry purée is divine. Located on the rarified Avenue Montaigne, this is high-roller territory, as evidenced by the liveried footmen who bestow access to everything from the hotel to the high-end designer boutiques lining the avenue. Snob appeal aside, there are plenty of top-tier museums within walking distance and you're only minutes away from the Champs-Élysées and romantic strolls along the Seine. It's just a 5-minute walk to Alma-Marceau and Franklin D. Roosevelt metro stations. Dining can be a wallet-draining affair around here, however, aside from nearby sidewalk cafés, you can still find places that won't make you blanche. Open all day, Bread and Roses (9-minute drive) is the perfect spot for a salad, sandwich, fresh quiche of the day and very good desserts. At La Maison de l'Aubrac (7-minute walk) you can dine with the locals on steak tartare, homemade foie gras and all the French classics. Besides a glass of wine at a café terrace, never a bad idea in warm weather, the best bars around are in pricey hotels (Georges V, Prince des Galles, etc.). That said, Mini-Palais's (11-minute walk) sprawling terrace and late hours make it a fine spot for a cocktail, or you can always pop over to the Crazy Horse Saloon (4-minute walk), a few minutes away, for some lascivious entertainment with your champagne. If you've got the budget and crave a full-on luxury experience be assured you won't be disappointed.